For many people, their knowledge of the waste industry extends about as far as seeing their garbage and recycling bins emptied every week or so and most would be very surprised to learn that activity is part of a $70 billion industry in the United States. 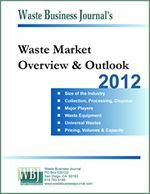 The industry is comprised of three major components: collection, which represents 62% or $44 billion in revenues; processing, which includes materials recovery and transfer station operations and is 12% or $8 billion in revenues; and disposal, which comprises landfilling, a nearly $18 billion by itself, and waste-to-energy, a nearly $3 billion enterprise, which together represent 26% of the waste business. Total industry revenue rose by 2.5% over the previous year and is up 12% over the last five years. It is projected to grow by $10 billion over the next five years to nearly $80 billion in 2021. 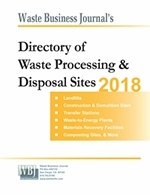 Those providing these diverse waste management services include publicly traded waste companies, which comprise $40.5 billion or 57% of industry revenues. Smaller privately held firms account for $16 billion or 23% of industry revenues, while municipalities or governmental players account for $13.8 billion or 20% of industry revenues. The industry as it is comprised today compares starkly in both composition and size with the early 90s, more than 20 years ago. Back then, municipal governments performed a much greater share of the service. Their participation in the industry was close to 35% then, compared to 20% today. Even more dramatic is the ascension of large publicly traded companies that accounted for only a third of the industry in the early 90s and now account for about 58% today. Industry economies-of-scale created a wave of consolidation that began the mid to late 90s and continues to this day. Recent acquisitions include Waste Connections' purchase of Progressive Waste last year for $2.7 billion, bringing together the industry's number 3 and number 4 waste haulers. Some will remember that company as IESI BFC and before that as separate entities IESI Corp and BFI Canada, which gives you an idea of how things change in this industry. Earlier this year, Waste Connections bought Groot Industries, a large Chicago, Illinois area hauler for close to $400 million. In 2014, industry leader Waste Management acquired Deffenbaugh Disposal Inc. of Kansas City for $405 million after earlier in the year divesting its waste-to-energy subsidiary Wheelabrator Technologies to a private venture firm called Energy Capital Partners for $1.94 billion. Meanwhile, a new publicly-traded company was created when Advanced Disposal offered shares to the public for the first time in September 2016 and made a secondary offering earlier this year, collectively raising about $700 million.